(in Latin munus, pl. munera, or "offered") is still a matter of debate. Many think that they descend from the Etruscan custom of making human sacrifices to celebrate the death of a nobleman, in order to appease the spirit of the dead. The Roman historian Livy, on the contrary, stated that the games originated in Campania, the region around Naples (where in fact there are many funeral paintings depicting scenes of duels and chariot races), and his statement has influenced greatly the experts. This option, however, should not conflict with the Etruscan one, in my modest opinion, since the Etruscans had had colonies and influence in Campania. Another theory which has recently gained acceptance gives the Samnium, a region in central Italy, as the place of origin of the games. 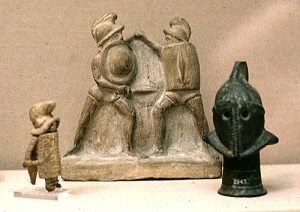 Moreover, the first gladiators wore the traditional Samnite weapons and attire. 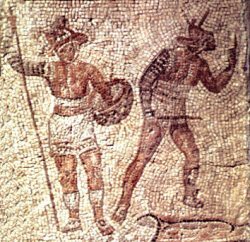 Later on, the gladiators' types diversified into different familiae, that sometimes reproduced the outfits of the fighters of distant countries. The games were at first strictly connected to religion and magic, though later on these features became less apparent and were almost forgotten. Whatever the origin may be, the first record of a gladiatorial fight dates back to 264 BC, when the sons of Brutus Pera offered such a spectacle in Rome to honour the memory of their father. During the III and II century BC the popularity of the games increased; Livy reports that in 216 the Forum hosted a combat of 22 pairs; in 183 sixty pairs of gladiators fought at the funerals of Publius Licinius Crassus; in 174 a show lasted for three days. In 105 BC the consuls were finally authorized to organize ludi circenses, so they became a public event. Many private munera were nevertheless organized also after that date. The last gladiatorial game in the Colosseum is recorded in AD 438, when the games were abolished by the emperor Valentinian III. The munera (games) expressed the rituals of the aristocratic class of the Italic world; not only were they religious ceremonies, but they became an exhibition of power and family prestige, and very soon they were immensely popular. Their number increased very rapidly, also for political reasons. Rich citizens who wanted to get the favour (and the votes) of the plebeians, whose vote was decisive for public careers, started offering games. 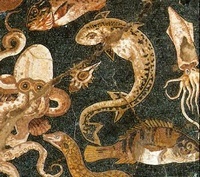 In Rome the organisation of the games was entrusted to magistrates, called curatores. The practical organisation (we would say production) of the show was entrusted to an editor, who contacted the lanista (the owner of the schools of gladiators) and advertised the program. The games were held, like religious ceremonies, on fixed days - the birthday of the emperor or some fausti anniversaries - but there were also extraordinary games and then also the ones offered by private individuals. The religious nature of the games was lost with the time, until "any pretext was good enough to regale the populace with combats" (Auguet). Not only gladiators: at the end of the Empire there were 177 "spectacle" days per year (10 for the gladiators, 66 for the circus and 101 for theatre plays). The games became almost an everyday matter, and during Caesars time a hunt was added to the gladiatorial combats to enrich the spectacle. In time, the shows grew in quantity and splendour: Julius Caesar himself gave a munus with more than three hundred pairs of gladiators. The taste of the spectacles changed as well: the public wanted to be astounded, so silver armors, exotic animals, choreographies, music and "special effects" were used. Even the sand of the arena probably received its share of special effects, by the addition of coloured stones: we know that the Circus Maximus was embellished with petra specolare (a translucent selenite) and that there Caligula and Nero in special occasions mixed the yellowish sand coming from the hill today called Monte Mario with minium (red lead) and crisocolla (green-blue copper oxide). During the games gifts were offered to the spectators; small balls or tablets, with the image of the gift stamped on it, were thrown to the public. One could win food, a slave, or even a house or a ship. And then there was the sparsio: to refresh the people petals of flowers and perfumes were thrown from above. Many laws dealt with the matter, starting from the republican times. One of the constant themes of the regulations seems to have been the desire to limit the organisation of games by the newly rich. One of the main worries of the ruling class was to limit the expenses of games, that could ruin a household, and to curb the pretensions of the new class of enriched merchants and liberti. This class movement was a social phenomenon that came together with the improvement of the economy in a peaceful Mediterranean. New classes of merchants, slave drivers, landowners made their appearance on the scene and sometimes posed a threat to the incumbent rich. They could afford enormous expenses in order to become popular and be accepted by the public and the high society. Julius Caesar established an organisation that would survive throughout the imperial age: he set up a gladiatorial school in Ravenna and introduced some changes in the management of the gladiators, so that they could even be trained by Roman knights and senators. Later on, the emperors furtherly increased the monopolistic nature of the organisation of the munera, which became something like a public service: in Rome practically all the games were offered to the people, at least formally, by the emperor, through a procurator. In the provinces instead this honour/duty was left to rich and prominent citizens, who were high priests of the imperial cult, and the games were dedicated to the emperor, no longer to the memory of the dead. When the new dictatorship (i.e.the emperors) was established, it dealt with the problem by creating a monopoly. The gladiators belonging to the emperor were called fiscales, or Cesarianii. The Roman Senate took measures to put some order into the organisation of the games and "check the public auction of state posts" (Auguet). 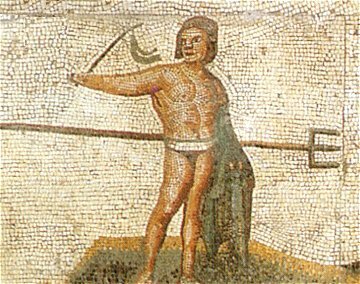 In the year 22 BC a law was passed to reduce the number of games offered by private citizens: an authorisation by the Senate was made compulsory, and one could not organise more than two games a year, with no more than 120 gladiators each time. In 61 BC a law was passed which entrusted the organisation of the games to the emperors and fixed the occasions (public events and official dedications) in which they could be produced. The production of munera had become a matter of public interest, as it was too important to be left to any private citizen who could exploit their popularity to gain credits and the favour of the masses (thus being a threat to the State and the authorities). Given the enormous expense of the munera, and their frequency, the emperor could renounce his privilege of offering the games in favour of local high priests (also called magistrates) of the imperial religion. In fact, provincial magistrates were obliged by city laws to offer munera on behalf of the emperor. This was often for them a big financial and organisational pain, even if they could use a fixed amount of public money. The magistrates that had already offered games could add to their title the one of munerarii (it seems that it was Caesar August himself to invent the title). And when the new classes of the rich liberti (ex slaves) started offering games, in the effort to imitate the behaviour of the Roman nobility, the maximum number of gladiators was restricted, thus reducing the value of these spectacles, in comparison to the lavish and splendid games offered personally by the emperor. In the city of Rome, for the practical organisation of the games, the emperors set up in the first century an organisation for the production of the games. There was the Ratio a muneribus, a kind of Ministry of Games with organisational and financial powers over the venationes and the munera. The production of the costumes and of the pegmata, the machines that appeared on the arena from the underground and unfolded producing an instant scenery, were built nearby - from Vespasian to Hadrian - in the Summum Choragium on the Summa Sacra Via. When that place was destined to the grandiose temple of Venus and Roma, the Summum Choragium was transferred nearby, in the region of the city called after the temple of Isis and Serapis (now around Via Labicana). A knight of the equestrian order was at the head of the Ludus Magnus, the main gladiatorial school of Rome. The other schools in Italy and over the empire were directed by officers called procuratores familiarum gladiatoriarum. For more info on the practical organisation see this page. Gladiators 2 : Will you live or die after your first fight as a Roman gladiator? Find out what fate awaits you on your journey to the arena. Based on the book You Wouldn't Want To Be A Roman Gladiator!